A lazily wandering or gently cascading garden stream is a small river that wanders through your yard. 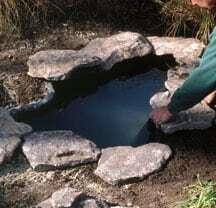 Many streams incorporate a modest waterfall and a small pool at the bottom, though they don’t have to. Water will need to circulate through the stream while the pump is operating, and the stream should hold some water when the pump is not running. That means that the stream should be nearly level; an average drop of only 1 to 2 inches per 10 feet is ideal. In most cases, you will need a small holding pool at the lower end of the stream. 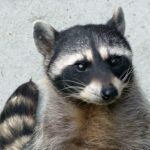 (You could instead install an underground holding tank, but that is a good deal of trouble and expense.) As with a waterfall, the pump sits in the bottom of the pool and sends water, through buried or hidden tubing, to the top of the stream. Typically, a stream is pretty shallow—anywhere from 3 to 10 inches deep. The narrower and shallower the stream, the faster the water will move. For a natural look, have your stream meander around a bit; for a formal setting, install a straight stream that looks like a man-made canal. Excavate for the stream, checking at all points to be sure it is gently sloped. Purchase a flexible liner and cut it 3 to 4 feet wider than the stream. Because the water is so shallow, you will need enough flat stones or gravel to cover the liner at all points. You may choose to stack stones up near the water level at one or more points, to create a sort of rapids. Consult with your dealer to choose a pump and tubing that will supply ample flowing water for your project. 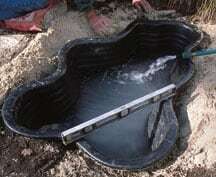 The easiest way to build a pond is by installing a rigid liner, also called a pre-formed shell. A rigid liner limits your design possibilities, but at home centers, garden supply sources, or online you can find a good variety of sizes and shapes. And you can greatly influence the look of a pool when you install stones and plants around its perimeter. Rigid liners are usually between 10 and 20 inches deep. Choose the deepest liner if you want to grow water lilies and raise fish. If you want to raise fish in an area with cold winters, make sure the liner is deep enough to allow for plenty of unfrozen water at the bottom. Some shells have shelves for shallow plants; make sure they are large enough for the plants you want. You’ll need a submersible pump with filter and a nearby Ground Fault Circuit Interrupter– protected electrical receptacle. The pump may send water up to a fountain in the middle of the pond, or it may direct water farther away, via a hose, to a stream or waterfall that flows into the pond. 1In a reasonably flat area, remove all grass and other plants. Press the liner into the soil to make an impression. Then pour flour or sand, or use spray paint, to mark the outline. Note that some areas will need to be dug deeper than others. 2Dig the hole an inch or two deeper and wider than the liner. Test fit the liner, and check its rim for level in all directions; you will probably need to do this several times. 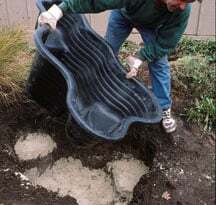 Pour in sand to support the liner so its rim is at grade level, and set the liner into the hole. You may choose to set in the submersible pump (with either a fountain or hose for a waterfall) at this point or wait until after it is filled with water. 3Once the shell is level and feels firm, slowly fill it with water. 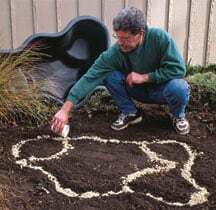 Add a 50/50 mixture of sand and soil around the perimeter. Use a 1-by-2 or other small board to tamp the sand and soil firmly as you go. Fill to nearly the top of the shell and then force sand and soil under the lip to support it. 4Set flagstones around the edge of the liner, to hide its rim. Set the stones in a sand/soil mixture so they are about 1/4 inch above the rim and barely hanging over the water. Plug the cord in. 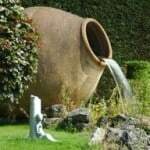 You may need to cut the fountain’s pipe to the right height, or run a hose to the top of a waterfall or stream. Cover hoses and cords with soil or mulch.